Stories and story telling can be a great way to engage students in a topic. If you teach ESL students with stories, however, you need to be prepared as students can easily get lost along the way. Pictures and visual materials often help to keep the students in the flow of a story. 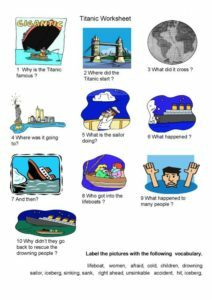 “Talking about the Titanic” is an English language exercise aimed at engaging students in a discussion about the Titanic. Students try to match the vocabulary at the bottom of the page to the pictures. Then they try to answer the questions and recreate the story of the Titanic in their own words. Click on the image below or the link to download the printable PDF file. 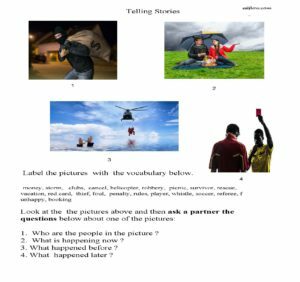 “Telling stories” is a story telling exercise using pictures. Students try to match the vocabulary at the bottom of the page to the pictures. Then they try to tell stories about the pictures. 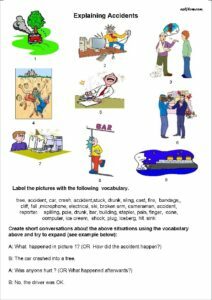 “Explaining accidents” is another story telling exercise. Students try to match the vocabulary at the bottom of the page to the pictures. Then they try to answer the questions. 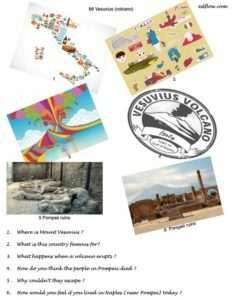 “Mt Vesuvius” is an exercise for discussing the volcano Mt Vesuvius. Students use their own ideas to answer the questions. 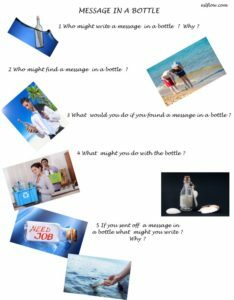 “Message in a Bottle” is a questionnaire for discussing and Imagining the story behind a message in a bottle. 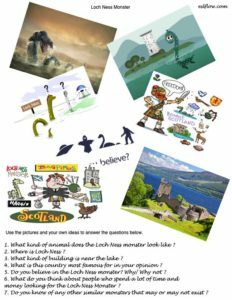 This is a questionnaire looking at the Loch Ness Monster and discussing the possibility of its exstence.